I swear guys. This could just be my best recipe yet. Because now, all that’s between you and a delicious home baked cookie is about 10 minutes in the oven. And just so you know. This isn’t some cheats skillet cookie, that doesn’t taste like an actual cookie. It is the real deal AND it is delicious. I’m talking fresh from the bakery-you won’t know how you lived without this recipe-delicious. And if that doesn’t sound awesome enough already. Get this. I’ve used rice malt syrup to add sweetness along with super dark chocolate chips. That means my cookie is lower in refined sugar than a regular cookie, but still totally yum. But, the absolute BEST part about this recipe? 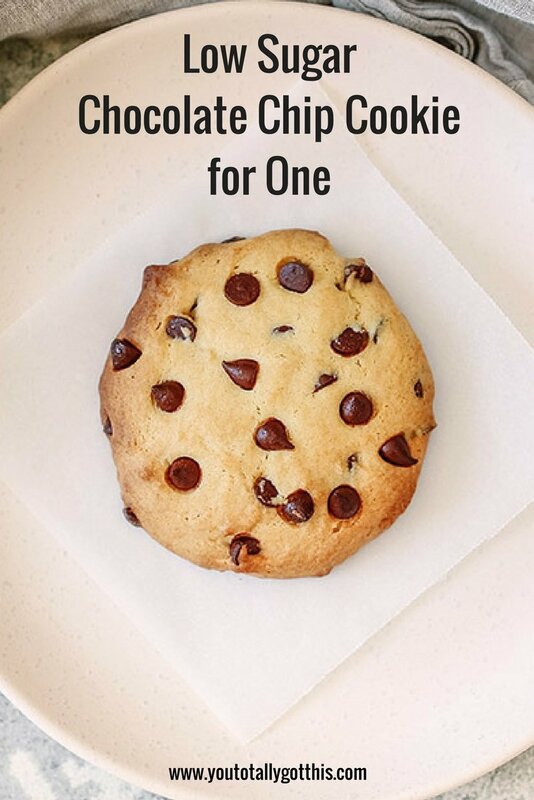 One cookie. 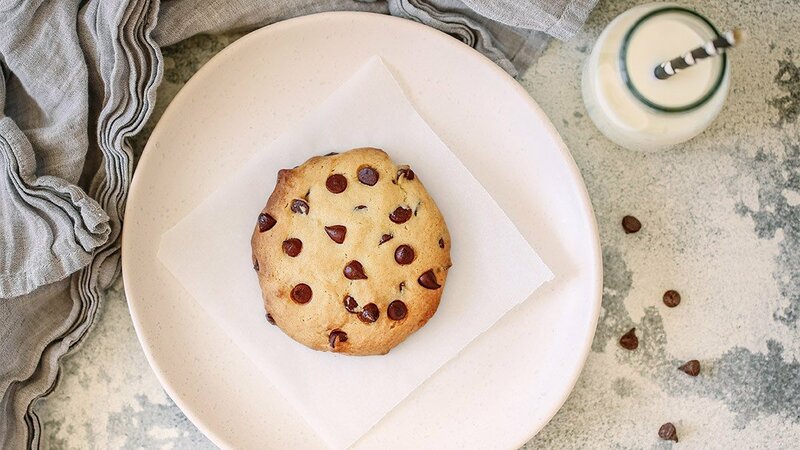 Because, when you’re craving cookies. Bake a batch, eat a batch. C’mon, you know I’m right. I suggest, you make this now. And if you’re not home, go home. You need to know how good this cookie is ASAP. Oh, and It’s big enough to share. But, I don’t recommend that. 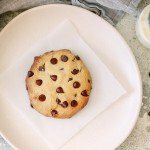 Have you made my low sugar chocolate chip cookie for one? Did you love it? I think you loved it…let me in the comments. I would love to talk cookie with you. 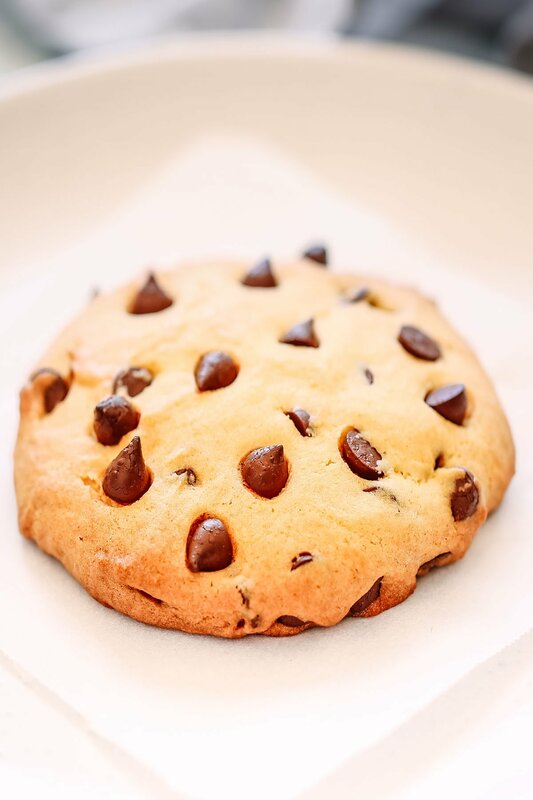 This chewy, soft, freshly baked, delicious chocolate chip cookie for one makes the perfect after dinner treat. Hot tip: Don’t offer to share! Remove butter from the fridge, preheat your oven to 180C and line a baking tray with baking paper. In a small bowl use a spoon to smoosh the flour, butter, and rice malt syrup together until all ingredients are combined and the mixture forms a dough. Stir through the chocolate chips. Spoon the mixture on to the baking tray, flatten into a disk, then use the palms of your hand to make a round cookie shape. Bake in the oven for 10-15 minutes or until the edges start to go golden, but the middle of your cookie is still light in colour. Be careful not to over bake or your cookie will be crunchy, instead of soft and chewy. The exact amount of baking time you need will depend on your oven. In my oven the cookies take 12 minutes with regular flour and 10 minutes with buckwheat flour. If you can’t find super dark chocolate chips, just chop some dark chocolate into chunks, or use a refined sugar free chocolate like Loving Earth. P.S – Now you’ve got your sweet treat sorted, get dinner sorted too. Grab your FREE quick and easy weeknight dinner plan right here. I think I just loved you a little bit more seeing this one ? Haha…Hope it’s something you can enjoy when you get home.